Middle East Perspectives by Rick Francona: Spain - the cowards who want "justice"
In the latest European court attack on American troops involved in the war in Iraq, a Spanish judge announced that he will re-issue an arrest warrant for three American soldiers he claims are culpable in the death of a Spanish journalist killed at the Palestine Meridian Hotel in 2003. What we have here is Spain, a nation that caved to terrorists' demands in the aftermath of the 2004 bombing o f some trains in Madrid, trying to re-assert itself as an antiwar, anti-American state. They've been successful - I'll call this episode "The cowards who want 'justice.'" 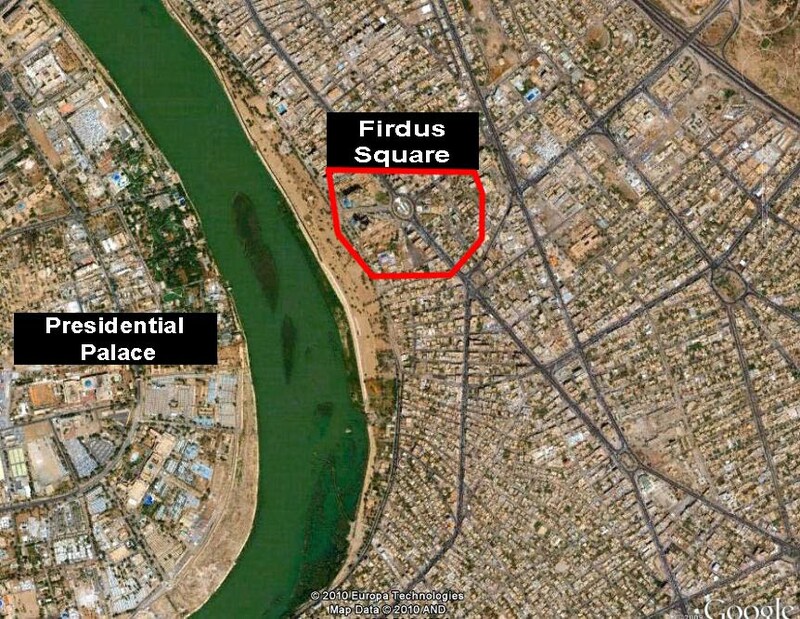 To get a better understanding of Spain's convoluted logic, it might be useful to explain the significance of the venue of the alleged crime - Firdus Square, located on the east bank of the Tigris River, across the river from and a bit north of the Republican Palace. 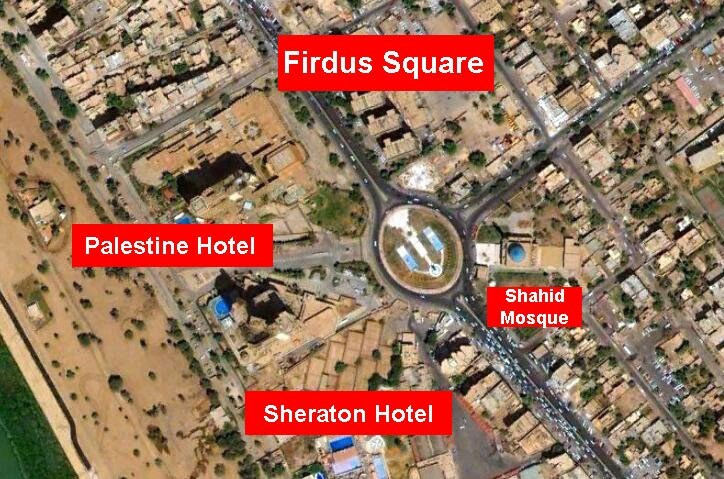 The square, which is actually a circle, is the location of two of Baghdad's better hotels, the Palestine (formerly the Palestine Meredien) and the Ishtar Sheraton (no longer affiliated with Sheraton). This is also the site of the Saddam Husayn statue that was attacked and pulled down when American forces entered the city. 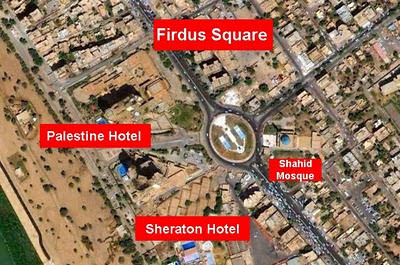 The Palestine and Sheraton hotels are on the northwest and southwest of the circle, respectively, and across the circle from the Shahid (Martyr's) Mosque, one of the prettier buildings in the city. 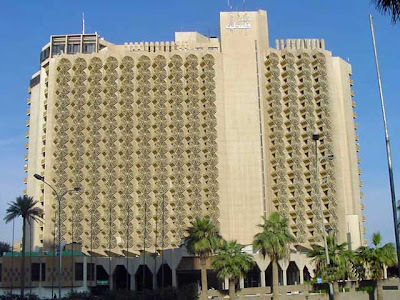 I have stayed at both the Palestine and Sheraton in Baghdad when I was a liaison officer to the Iraqi directorate of military intelligence - always at Iraqi expense. Both were quite comfortable, not as nice as the Rashid, but I only got to stay at the Rashid when traveling with my boss. Senior Executive Service civilians qualified for the Rashid, Air Force captains did not. The rooms and restaurant at the Sheraton were nicer, but the Palestine had a great bar decorated like a Bedouin tent as well as a casino. I digress. According to U.S. Army records, on April 8, 2003 during the initial American assault into Baghdad, an armor battalion approached the Palestine Hotel. One of the soldiers in one of the tanks believed there was an artillery spotter operating from one of the higher floors of the Palestine - he eliminated the threat with a round from his main gun. Before I continue, let me say that I would have done the same thing. Unfortunately, two journalists died in the attack; one was Spanish citizen José Couso. 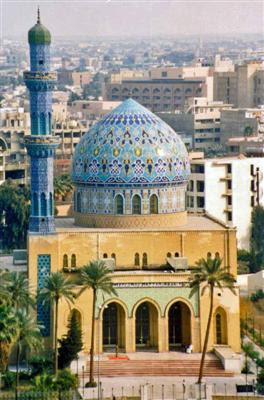 Firdus square is in the heart of Baghdad. It would make sense for any attacking military force to find its way to the square. The two hotels on the square are the tallest buildings in Baghdad and would make ideal observation and/or sniper positions. Approaching an 18-story and 26-story building in a tank is dangerous in any case. These tanks were the vanguard of the American thrust into the city - the soldiers were no doubt concerned for their safety. Anything that appeared to be hostile would be engaged. In May 2003, the Committee to Protect Journalists issued their findings that the "attack on the journalists, while not deliberate, was avoidable." The report also acknowledged that American forces were aware that the Palestine Hotel was a favorite of journalists and wanted to avoid having to fire on it. This report is from a group not known to be friendly to the U.S. armed forces. A U.S Army internal investigation in August 2003 cleared the soldiers since they believed they were firing on enemy troops. Yet, we now have a Spanish judge bringing an indictment against three of the Americans involved in the unfortunate incident. The three men are charged with homicide and committing a "crime against the international community." Spain, who did not have the courage to face a bunch of terrorist thugs, now sees fit to attempt to try American troops for actions in combat in Iraq. The Spanish judge also ordered the three men to appear in a Spanish court. It is this type of ridiculous proceeding that demonstrates the reasons the United States Senate will have difficulty in getting a two-thirds majority to ratify American membership in the International Criminal Court. It opens our service members up to these frivolous types of legal maneuverings designed to embarrass the United States. Please note that both President Barack Obama and Secretary of State Hillary Clinton strongly support American membership in the ICC. Of course, neither has worn a uniform, and the closest either of them has come to hearing a shot fired in anger was Hillary's falsified claims (that's diplo-speak for lying) of landing at a Bosnian airbase under sniper fire. On March 11, 2004, ten explosive devices exploded in Madrid on four commuter trains, killing 191 people and wounding almost 2,000 others. The attack was supposedly executed by an al-Qa'idah-inspired North African Islamist group. The attacks were timed to coincide with the Spanish general elections to be held on March 14. Based on the threats, the incumbent party of President José María Aznar - who supported the invasion of Iraq with the deployment of 1,400 Spanish troops - was defeated at the polls. One of the first actions of the new government was to announce the withdrawal of Spanish troops from Iraq, as demanded by the terrorists. A truly pathetic performance - this is the action of a NATO ally? Now, for whatever reason, the Spanish courts want to try three American soldiers for murder and some nebulous "crime against the international community." Other Spanish journalists (and I use the term loosely) contend that the attack was a deliberate attempt to kill journalists or somehow send a warning to the reporters is ludicrous. The U.S. military has the most open access for journalists of any armed forces in the world. 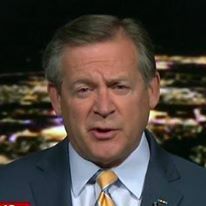 Reporters, including those from foreign - and not always sympathetic - press organizations like Al-Jazeera, were embedded in American military units at all levels. The problem is that the three soldiers may be arrested if they are deployed to other ICC-signatory countries and extradited to Spain. The United States needs to demand these indictments be dropped. Sadly for our troops, if we are waiting for the Obama administration to make the case, we should be prepared to wait a long time. Obviously, these three soldiers will be bypassing Spain on their next vacations. I suggest we all do the same.